My great-great grandmother was Rochel Fuchs Rutner. Although she never lived outside of what's now Subcarpathian Ukraine (although it was Hungary when she was born and Czechoslovakia when she died), I actually have gathered quite a bit of documentation about her life. But I never knew exactly when she died. I have the death records from Kolodne and Dulovo, where she lived from the time she married, and her death was not recorded. I did have a window of when she would have died; she was alive in 1920 when my grandmother's older brother came to America, and she had a granddaughter named for her in 1927. In addition, when her husband died in 1928, he was listed as a widower. I had been in Kolodne back in 2016, and I photographed what is left of the Jewish cemetery. When I got home, I transcribed all of the tombstones, and sent the transcriptions and associated photos to JewishGen's JOWBR. The other night I wanted to check on a particular tombstone to see if it correlated with a lead I was following (more to come on that lead in a future post), and I was being lazy, so instead of searching through my computer, I just searched for Kolodne graves on JOWBR. And this is why being lazy can pay off! I've mentioned the awesomeness that is Alex Krakovsky's wiki before. If you have ancestors from Ukraine, check it out if you haven't yet. And if you've already visited, go again--he's constantly adding more documents. 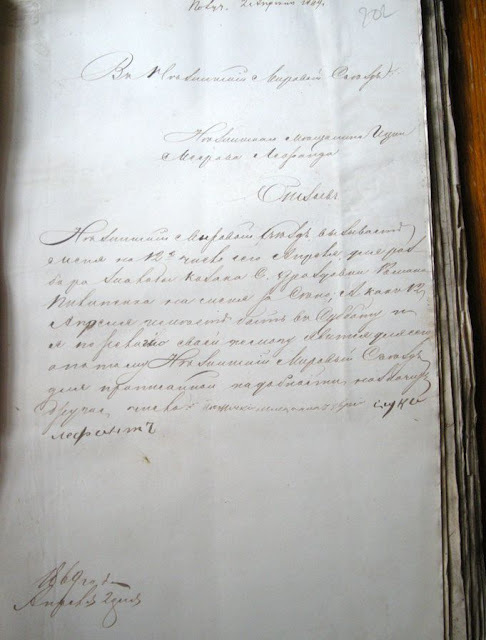 I checked this week and found that a document from my ancestral town of Kuna had been added (which you can see here). 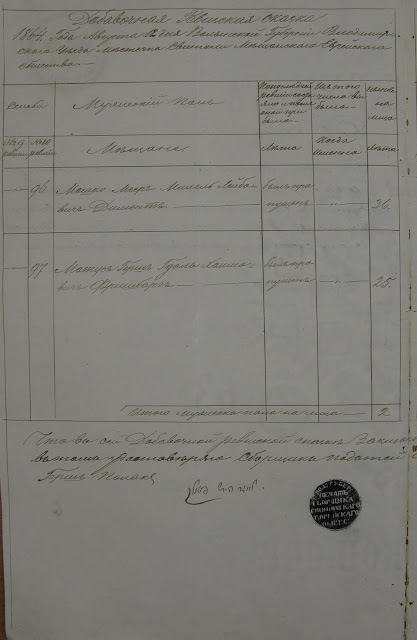 Since the document was from 1903, I wasn't too optimistic about my finding my direct ancestors, since by 1875 they were living in Shpikov, but I thought that perhaps I'd find some relatives. Well, this document ended up having way more information than I anticipated. Spoiler alert: I've gone back another generation and verified another ancestor's name, among other things. After a crazy November/December with a lot of travel, it looks like 2019 will be off to a similar start. 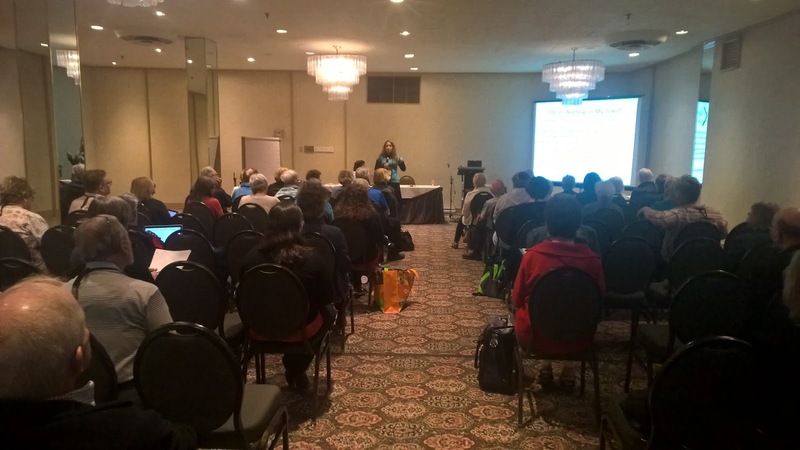 I met lots of awesome genealogists at various events, and I'm sure that will continue into the winter. I'll be speaking all over the country, and hopefully some of the people who read this blog will live nearby and can attend at least one of these sessions. Come by and say hi! So here are some details. DNA Hinting At Ancestral Origins? Genetic genealogy doesn't exist in a vacuum. 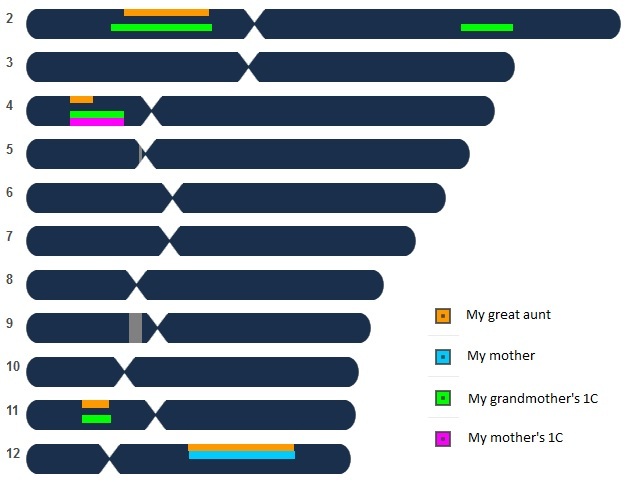 Many people who take DNA tests assume that their results will come with a fully populated (and maybe even documented) family tree back generations. 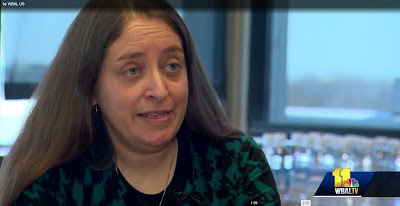 While DNA doesn't work like that (unless you are a good match to me), it can point you to places to do additional research, that you may not have known about otherwise. Last Sunday, I got a message through MyHeritage from a woman named Kathy who said that many of my kits matched her sister-in-law Dorothy. Generally when I get messages like this, I ask which kits match, and then I get to respond that they are from various lines of my family and are not related to one another, and I explain about endogamy. But her response was different. Everyone that Dorothy's kit matched was related on my maternal grandmother's side. So I took a look. My great-uncle, Izzy Joshowitz, was my grandmother's older brother. He was born in what was then Czechoslovakia (and is now Ukraine) and came to America when he was 7 years old. During World War Two, he was an officer in the Army Air Corps. As the war ended, he was sent to Bergen Belsen, where he met some cousins (who he had never before met in person, as they were born in Europe after he left to America) who had survived. If you have ancestors who lived in what was the Russian Empire, you must know about j-roots. Check out the below guest post that talks about this resource and how English speakers can best interact with it. The following is a guest post from Dmitry Pruss. Dmitry Pruss lives in Salt Lake City. A native of Moscow, Russia, he holds a Ph.D. degree in Molecular Biology and works in the field of human genetics. 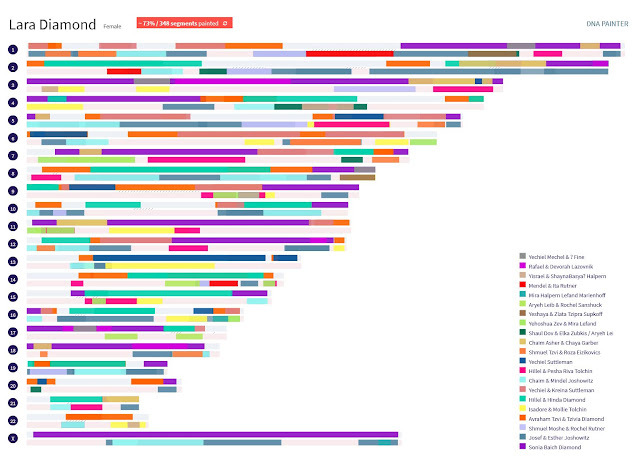 Since 2006, his projects included solving heritable disease riddles by combining DNA testing with the classic kind of a gumshoe genealogy. Dmitry is a volunteer moderator of the Onomastics section of the Jewish Roots portal, and a contributing editor of Avotaynu magazine. Did your great grand uncle attend college in Odessa or St Petersburg? Did you great grand aunt take apprenticeship exams for a pharmacist or a midwife ? Was their cousin sent to Siberia for anti-government agitation - or perhaps a petty crime? Or maybe an ancestor's signature graced a shul petition, or a plea to the authorities asking for a fire or famine relief? The old country Jews interacted with the Czar's oppressive government in a myriad ways, always having to prove who they were, where they hailed from, who were their kin. Along the way, they left priceless breadcrumbs of genealogy information. It is still there in Eastern Europe's archives. The vital records may have been lost as the local archives went up in flames during WWII (note from Lara: Many do still exist though, as you can see in many of my blog posts), but the authorities hoarded up so much paperwork in their quest to suffocate the Jews, that the tales of your family are still preserved in as unlikely places as Moscow where millions of police file cards catalog all the brushes of the Jews with the system, or the Kremlin of the ancient capital of Siberia, overflowing with correspondence about prisoners and exiles. 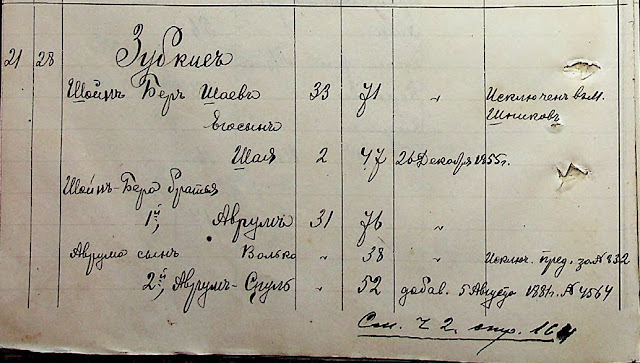 Over a nearly decade of its existence, Jewish Roots portal (http://j-roots.info/) has become the leading force in Russian Jewish genealogy research. It is busy uncovering and digitizing new genealogy sources in the archives of the former Russian Empire, and building a valuable help base of advice on genealogy searches, both for the online investigators and for those doing their research on the ground, in the archives, libraries, and cemeteries. I had a post on a genealogy success story nearly completed, and I was planning to finish it today. But in light of what happened in Pittsburgh yesterday, that post will wait. I would not be here today if it weren't for the Pittsburgh Jewish Community (on my mother's side) and HIAS (on my father's). My mother's parents were born in Pennsylvania. My maternal grandfather was born in and grew up in Pittsburgh; both of his parents, all four of his great grandparents, and one of his great-great grandmothers emigrated to Pittsburgh. My maternal grandmother's parents emigrated to nearby McKeesport, where my grandmother was born. My grandfather's family was very involved with Pittsburgh's Jewish Community. 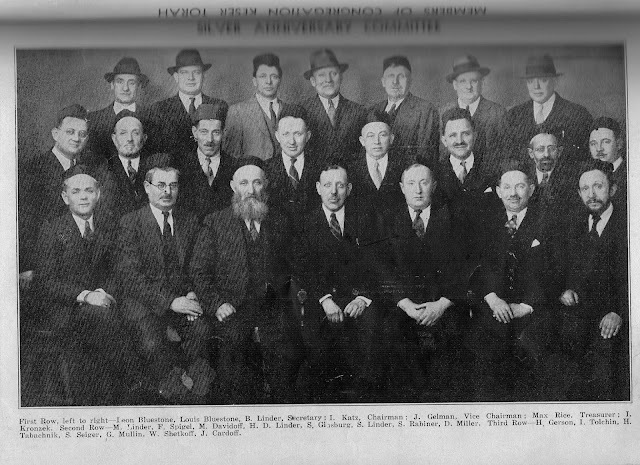 My great grandfather was president of Pittsburgh's Shpikover Society, and my grandfather's whole family was very involved in Pittsburgh's Keser Torah Congregation. This past summer, I found the death record for my 5th great grandfather, which gave me his father's name. I've also found the name of his wife, my 5th great grandmother. My great-great-great-great-great grandmother was Chava Lefand. I do not know her maiden name, but her father's name was Volko/Volf. After my grandmother passed away in 2015, my cousin Michael found some photos in her basement. Many were the originals for photos we had copied earlier. Some were new (to me). 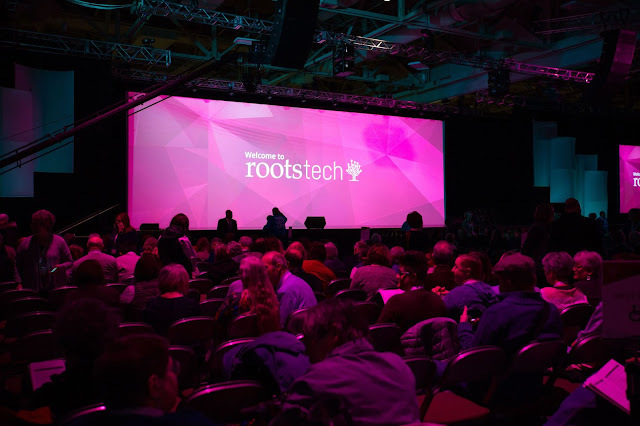 I'm excited to announce that I'll be back at RootsTech this winter--both as a speaker and an Ambassador! I'll be giving on class on Jewish genealogy and another on endogamy. This will be my fourth year in a row attending this conference, and I cannot wait. Why RootsTech? The conference gives a great overview of that here (check it out!). My November/December 2018 will be subtitled, "Who Needs Weekends, Anyways"? I'll be speaking all over the country, and hopefully some of the people who read this blog will live nearby and can attend at least one of these sessions. Come by and say hi! You can see the full list of upcoming talks, scheduled into 2019 here. Back in November 2016, a new match popped up on FamilyTreeDNA. This person, IK, shared some very large segments with several of my family members. Despite the fact that everyone involved here is 100% Ashkenazic Jewish (so endogamy abounds), these large segments imply that there is an actual close relationship. Rosh Hashanah is coming up next week. So I wanted to share a family Rosh Hashanah card with readers. My grandmother's first cousin was Chaiky Wollich Chechman, who grew up in Sienkiewiczowka, Poland (now Senkevychivka, Ukraine). Chaiky and her husband Mendel, as well as their young daughter Devorah, were all killed in the Holocaust. But in 1935 things were still good, and they sent out cards to their friends and relatives. Since I was already in Warsaw, I took a high-speed train to spend a whirlwind 24 hours in Kraków. One of the first things I did after dropping off my backpack was to head to the Remah Cemetery. 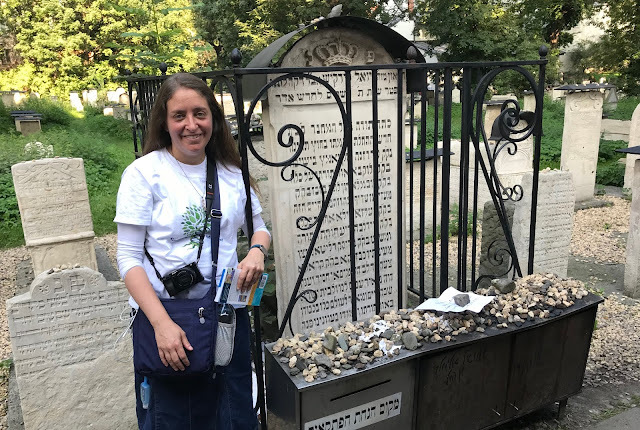 My 11th great grandfather (yes, you read that right--it helps when you can connect to a rabbinic line) was buried in Kraków in 1640. Rabbi Joel Sirkis, also known as the BaCh, after his Bayis Chadash writings, served in many communities in the area, the final as a Rabbi in Kraków. He even has his own page on Wikipedia. Alex Krakovsky added some more scanned Ukrainian documents to his awesome Wikipedia page. No, they are not in English. But yes, it's also worth learning how to at least read names in Russian. Because there is some awesome stuff here. As a side note, recent regulations are stopping Alex from doing this incredible work. Check out some of his videos such as this one on his Facebook page--and make sure others know about what's happening. 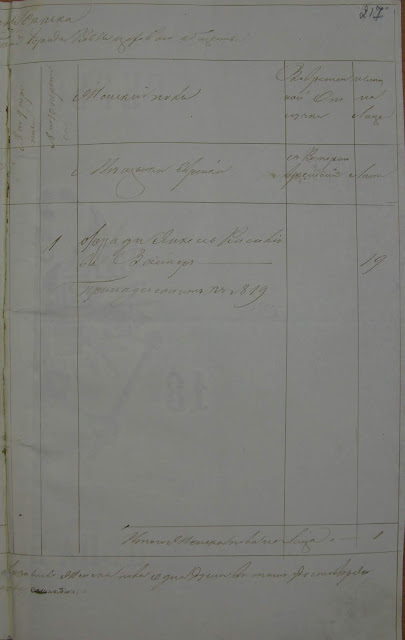 Alex recently added two census addenda from the 1860s for Volhynia. These are additions to a main census, but there are still a lot of names. I initially went through the first file, which covers 1862-1863 and didn't find any of my family surnames. So I then looked at the second, which covers 1862-1865. And here I found something intriguing. 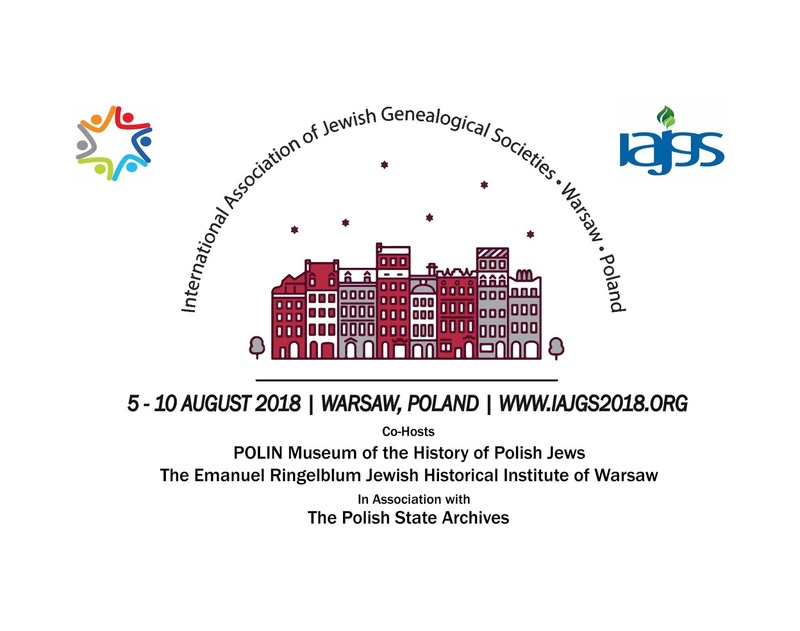 This is the fourth in a series of posts about IAJGS2018. You can read other posts I've made from this and other IAJGS conferences here. JewishGen held an evening event, where many exciting new developments were unveiled. Avraham Groll opened the session, presenting JewishGen's Volunteer of the Year. This is the third in a series of posts about IAJGS2018. You can read other posts I've made from this and other IAJGS conferences here. Since I woke up early (thanks, jet-lag! 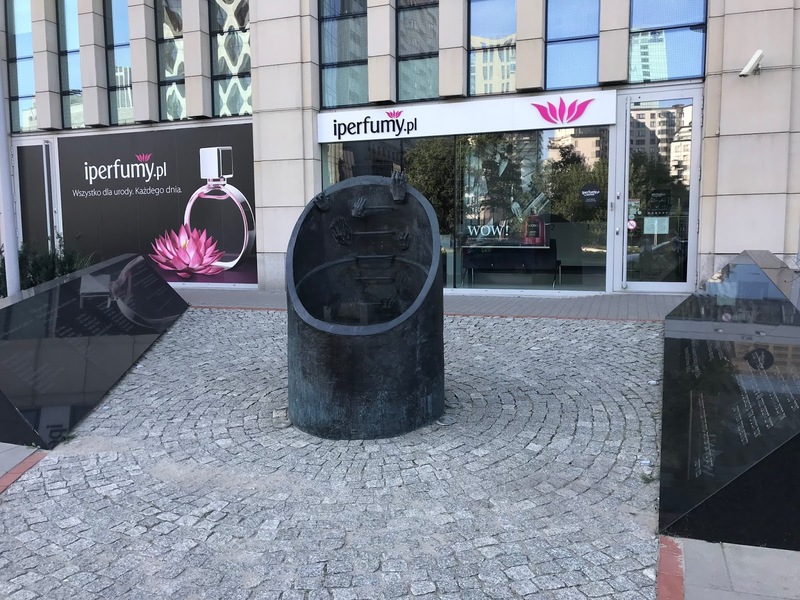 ), I walked down the block to the Monument Commemorating the Evacuation of Warsaw Ghetto Fighters. It was kind of oddly placed, since it's currently right in front of a perfume store. I then continued walking to see a remaining fragment of the ghetto wall, which is currently in the middle of a parking lot. These days, names have a set spelling. I cringe when someone spells my name "Laura." But it wasn't always that way--spellings of names used to be much more fluid and wasn't a big deal. But often people researching a family disregard individuals with names not spelled the way in which they are accustomed. They insist that those individuals with other spellings simply could not be the right family, so they miss clues that truly are connected to their own family members. 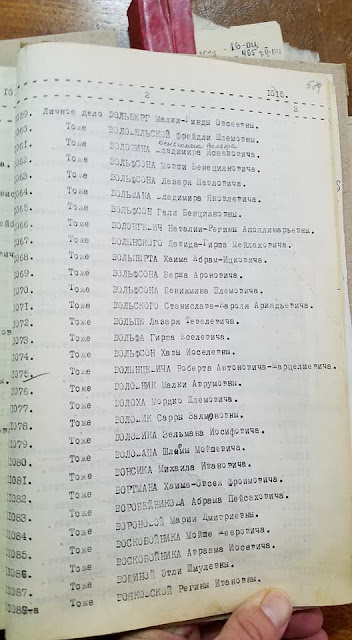 Well, I was recently indexing an 1892 death register from the Munkacs district (then Hungary, now the area around Mukacheve, Ukraine), and it's a great example for how fluid name spellings could be. With only 7 deaths recorded on this page, 4 of the deceased (all young children) had surnames spelled differently from their father's surname. This is my second post about my time at IAJGS2018. You can read other posts I've made from this and other IAJGS conferences here. Sunday evening, I went to Umschlagplatz, from which over 250,000 Jewish Warsaw residents were deported to death camps. Monday morning started early, at 8AM. I was fully armed with a large cup of coffee. The first two talks were DNA-related. First, Adam Brown spoke about the huge Avotaynu Project he is doing, concentrating on Y-DNA. I'm just back from IAJGS2018 in Warsaw! I'm extremely jetlagged, but the trip was very worth it. This will be the first of several posts I plan to make about the trip. You can read other posts I've made from this and other IAJGS conferences here. 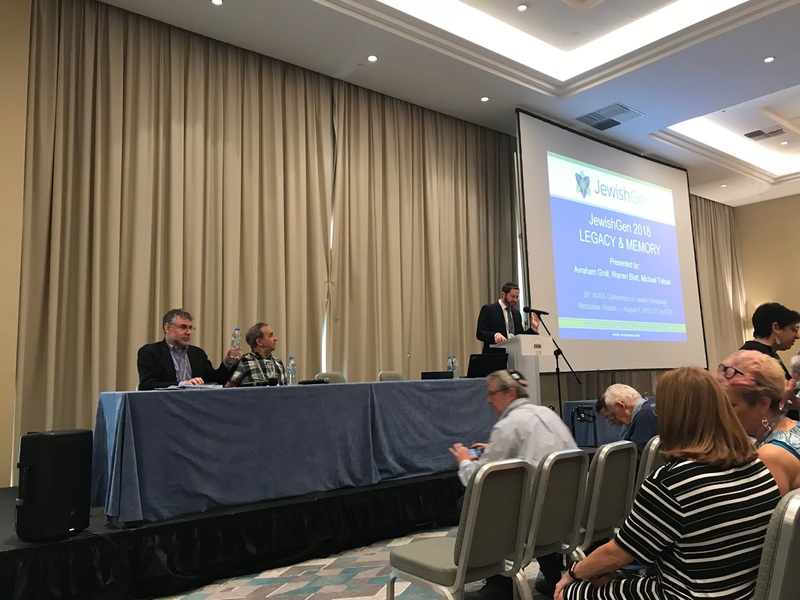 I made a few non-genealogical stops on my way to Warsaw, but I also learned about the Jewish communities in those locations--and their fascinating histories. My first stop was in Helsinki, Finland. 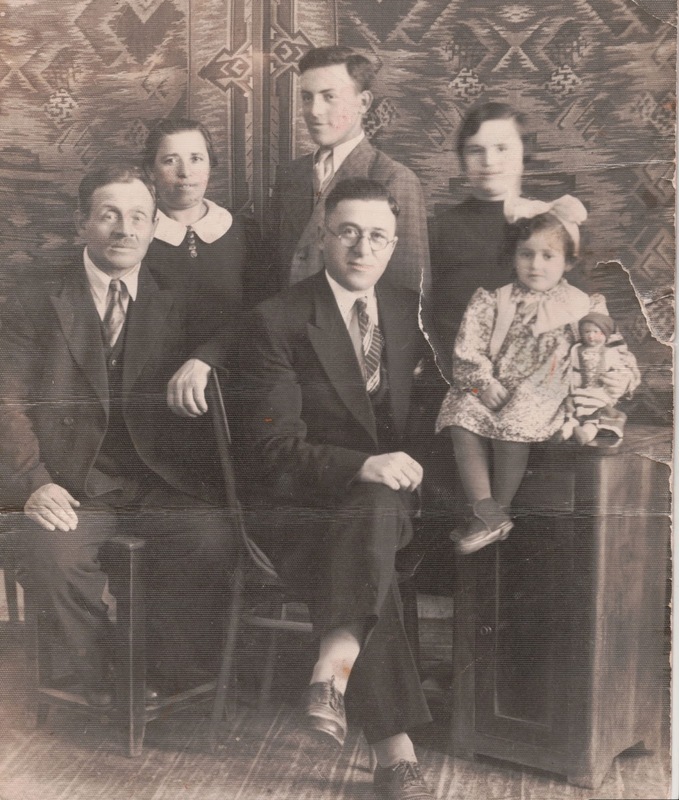 Back in January, I wrote about how I was no longer sure that my 4th great grandmother was Shayna Basya Halpern. 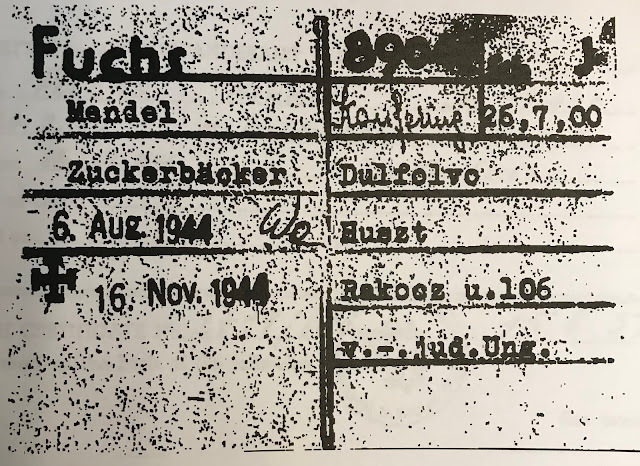 I'd found a birth record for a Yisrael Wolf Halpern whose father was given as Yitzchok son of Yisrael Halpern--my great-great-great-great grandfather. 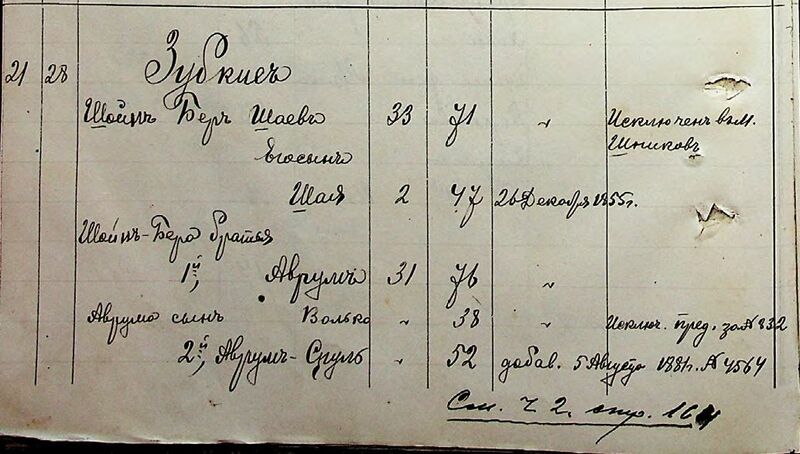 I've viewed 60 years' worth of Nezhin birth, marriage & death records (no, I don't sleep well) in the past few weeks. 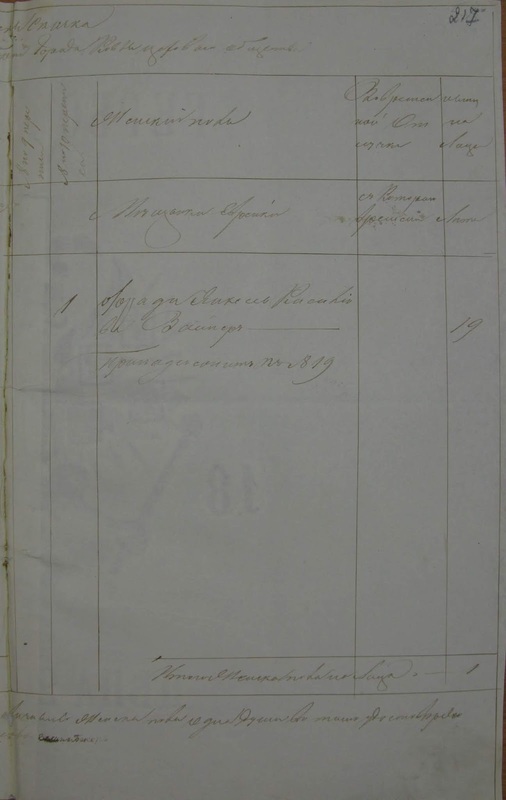 I found multiple records for Tolchinskys who were registered in Lubny but living in Nezhin from around 1866. All of these people are descended from my great-great-great grandfather Shimon Tolchinsky, and I've been able to fit them into my tree. Well, all except one. Earlier in the week, I excitedly posted that I had discovered my 5th great grandfather's death record--and that in doing so, I'd discovered the name of my 6th great grandfather. Well, that was nothing. Now that I can access lots of Nezhin vital records and tax poll censuses from home (see if your own town's records are covered by following the directions here), I've been slowly going through them. And there are many thousands of images. The vital records start in the 1850s, and in the 1858 death records, I found an exciting (to me) record. IAJGS2018 is coming up in just under a month. This year it's in Warsaw, and I'll be presenting and mentoring. If you're a regular blog member who will be attending, please come by and say hi! Newspapers can be a wonderful resource to get insight into ancestors' lives, beyond the brief facts noted in census records, ship manifests and the like. My great-great grandfather, Yechiel Suttleman, was married three times; his third wife, Ida Himelfarb Suttleman, was the only spouse who came to America. There are lots of family stories about how the family made moonshine and had the younger kids sell it (since they'd be more likely to be let off if/when caught). But the January 5, 1923 edition of Baltimore's Evening Sun mentioned how Ida herself had been arrested for possessing moonshine. I've been tracing the children of my great-great-great grandmother Mira Halpern Lefand Marienhoff for years. I had the birth records for a set of twins born to Mira and her second husband, Yitzchok Marienhoff; Yaakov/Yankel and Chava Marienhoff were born in Nezhin on July 1, 1887. My Lefand, Tolchinsky and Halperin ancestors lived in what is now Nizhyn, Ukraine. Since recently many Ukrainian vital records went online (including those of Nizhyn/Nezhin!! 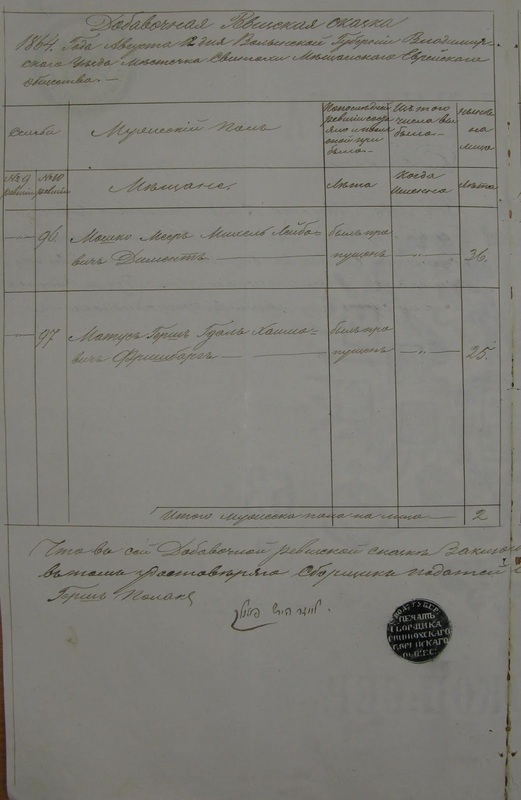 ), I've been going through all of the town's metrical (vital) records from the comfort of my home. I've gone through these records on microfilm, but the writing is much easier to read on my laptop--plus, I'm not limited in seeing them at a Family History Center during the hours they're open. As I was browsing through these records, I saw a familiar surname that wasn't one of my family's. Yesterday, I wrote about how I'd finally found a post-1910 mention of my great-great grandmother's half sister. This sister emigrated to America as Liba, was enumerated in the 1910 census as Elizabeth and then was married and was enumerated in 1920 as Lizzy. In 1920, she was married to Frank Trachtenberg, and they had two children: Margery and Edward. And then I couldn't find them again. I'd searched for the family using wildcards in the surname to try to find them if Trachtenberg had been horribly mis-transcribed. I tried just searching for them as a family group without a surname as well--but I found no family with a Frank, Elizabeth/Lizzy, Margery/Marjorie and Edward/Eddie/Ted. I'd asked for readers to help. And Kira Dolcimascolo came through. She pointed out that Frank and Elizabeth's grandson had posted on an Ancestry message board back in 2008. My great-great-great grandmother Mira Halperin Lefand Marienhoff was married twice and had at least eleven children (in addition to a number of stepchildren). Five years ago, I did a series of posts about most of those children and what I knew about them at that point. I'd managed to trace descendants of all of Mira's children who came to America--with the exception of one. I simply could not find any trace of Liba Marienhoff (who became Elizabeth in America) after the 1910 census, when she was living in Pittsburgh. You can click here to see what I knew at that point (and until about a week ago). But now I've found her--and how I did this highlights how spelling of names, especially among immigrants, was simply not important to them. So try as many possibilities as possible to try to find your family. Sometimes it's the key to solving a long-time mystery. FamilySearch recently announced that all of their filmed records from Ukraine are now available for free, from your home! 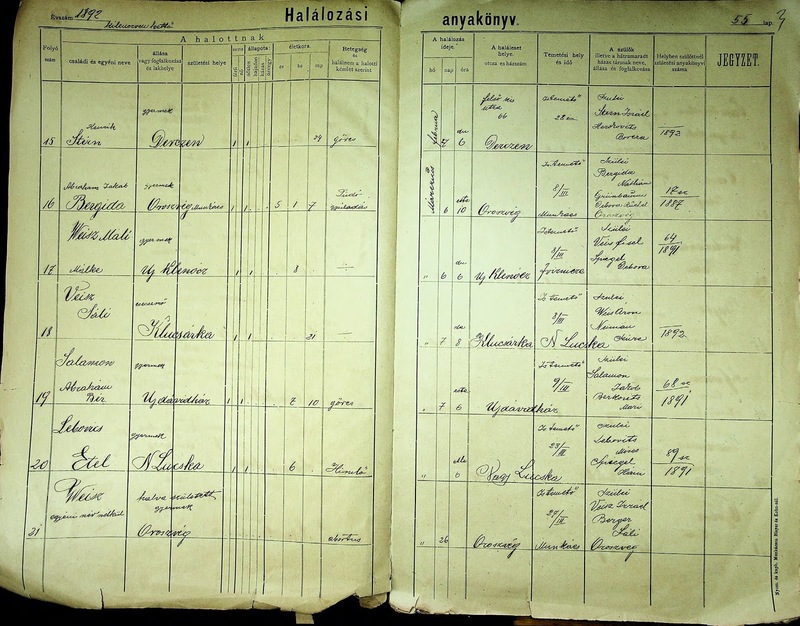 But how do you best figure out what records may be available on FamilySearch for your ancestral towns? Here are some tips (which are applicable to all locations, not just Ukraine). 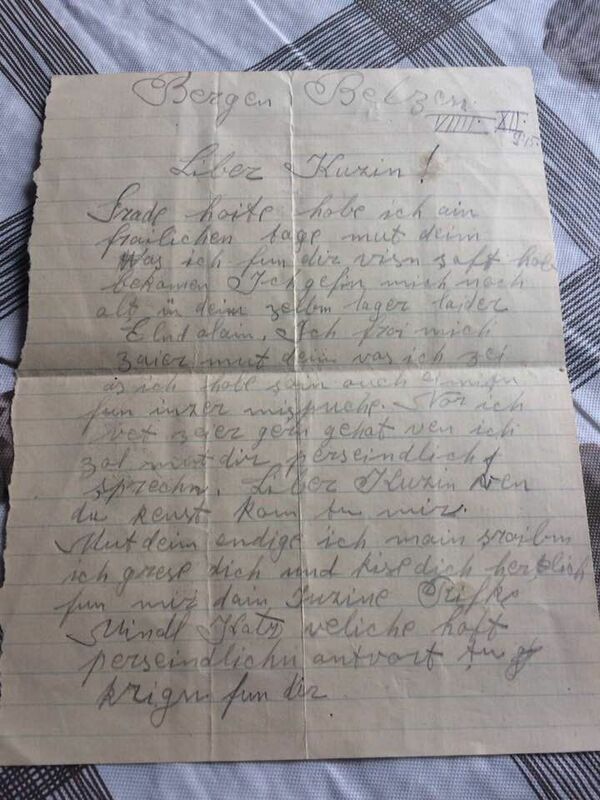 I've written before about how in Austria-Hungary, many couples had a religious wedding and were considered fully married by their communities; however, they never civilly registered their marriage, so their children were considered illegitimate. 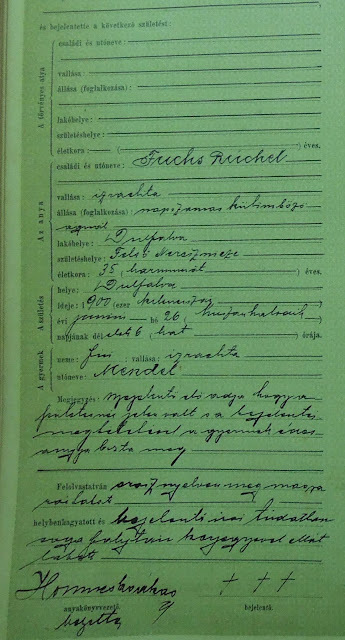 In fact, I believed my great-great grandparents (Shmuel Moshe Rutner and Rochel Fuchs) were in this situation, as their children whose births were registered in civil records only listed a mother. My great-great grandfather was Hillel Diamond. My great-great grandmother was his wife Hinda, but there were rumors that Hinda was not Hillel's first wife. Those rumors were correct--and that first wife had an interesting backstory. I've gotten many of my family lines back centuries, but the Diamonds have always been a brick wall. I knew my great-great grandfather (Hillel), and that was it. My grandfather had told me the names of some of Hillel's children and had also said that there was a rumor that he had been married before he wed my great-great grandmother Hinda. Well, the rumors were true--and by verifying them, I've gotten back another generation in the Diamond family.